Tertullian: Lieftinck, G.I., A fragment of Tertullian's De Spectaculis from a manuscript of the ninth century, Vigiliae Christianae 5 (1951) pp.193-203. Vigiliae Christianae 5 (1951) pp.193-203. FROM A MANUSCRIPT OF THE NINTH CENTURY. It is now the second time that Mr. A.-P. van Schilfgaarde, the energetic archivist of the State of the province of Gueldre, has surprised me by sending me fragments of a Carolingian MS. Each time they were endpapers or chemises which had been employed to protect the bundles or the registers, pertaining to municipal or personal archives, in the keeping of the central depot. 1 Thanks to the comprehension of this benevolent colleague it is possible now for me to communicate a quite sensational find. 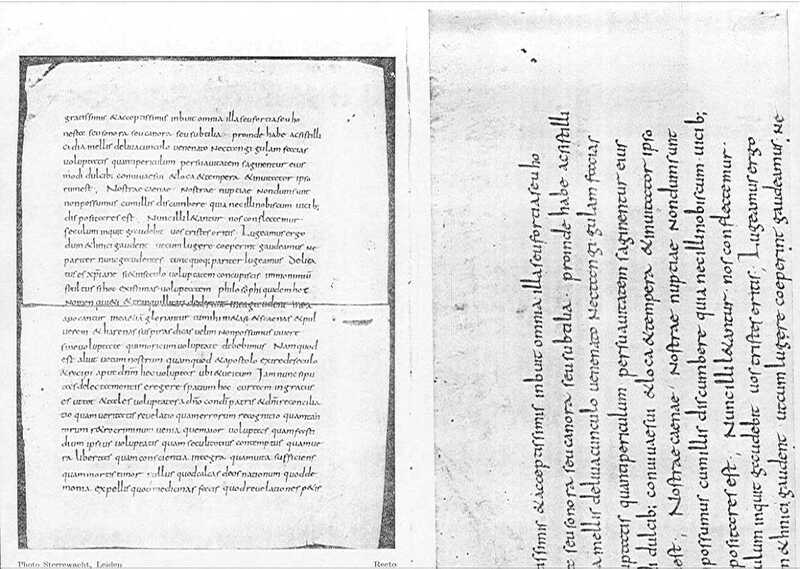 I am all the more happy that, since this publication can appear in Vigiliae Christianae, everyone will understand that the communication of this fragment could not be better placed, since it concerns a vestige of a codex of Tertullian which actually dates from the beginning of the 9th century. It is a leaf cut into two of his treatise De spectaculis, one of the rarest works of this author. 1. The first time it was a chemise for the accounts of the table of the poor (Provisorie) of Doesburg of 1558-' 70. Mr. A.-J. van of Ven, formerly archivist-assistant of the province of Gueldre, had found it while making an inspection and Prof J. - F Niermeyer of Amsterdam drew my attention to it. The fragment has been deposited on loan at the library of Leyden (B P. L 2507). It is part of a leaf of an Old Testament of the beginning of 10th century (P) of a very beautiful penmanship showing the influence of the school of Tours (here and there is to be found a semi-uncial of Tours). Undoubtedly this fully-realised writing must be assigned to a very significant milieu. Perhaps the perfect rhythm and the round forms prefigure the magnificent style of the Italian mss. of the eleventh and twelfth centuries. of the Library of Leyden. The library is further very pleased especially to have obtained the right to renew this privilege each year before the first day of August. This small treasure will be there next to the famous large-folio manuscript of Tertullien, copied and illuminated for the library of Ferdinand I, king de Naples (1458-' 94). 2 This beautiful ms, acquired in 1659 for the sum of 125 fls., is certainly one of the jewels of the art of the Renaissance, but is however of only a relative interest for philology. It is different of our fragment: a remainder of the treatise De Spectaculis, coming from a ms of the 9th century, is a source of the first importance. The text of this treatise is based directly only upon one carolingian ms, the codex Agobardinus of Paris, 3 an ms offered by the Agobard bishop of Lyons (816-840) to the church of St Etienne of that city. Martin Mesnart made use of this ms around 1545, year of the editio princeps insofar as that relates to De Spectaculis, but he seems to have also used another ms, unfortunately lost since then. 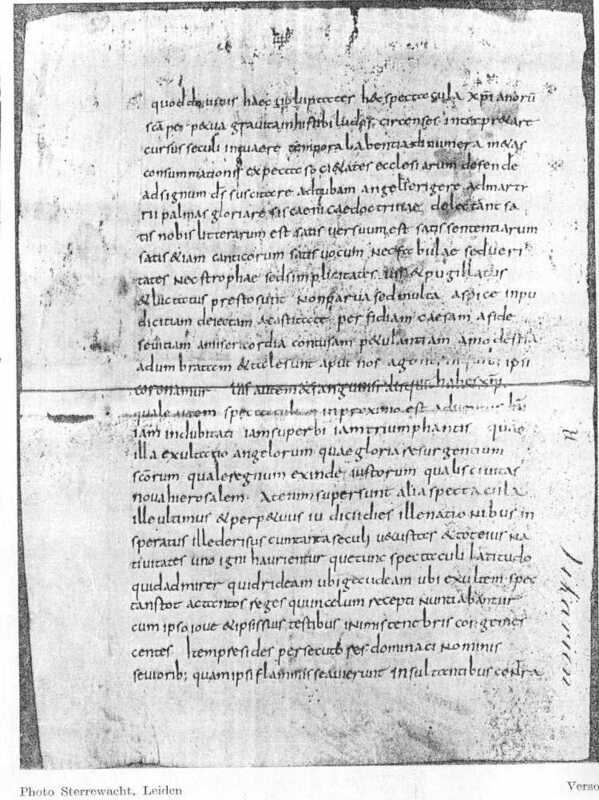 According to the methods of his time, he only accounted for the use of his sources in such way that it is very difficult to relate to any ms now.4 The text of Agobardinus, because it still exists, leads us to suspect the existence of another ms, but for lack of unquestionable evidence it has never been known to what degree the variants are really based on the text of another ms. One wondered whether it were necessary to sometimes allot those to the sagacity of the editor himself. The modern editors of De spectaculis have always generally preferred the text of Mesnart to that of the Paris codex. Scholars will therefore be interested in the fragment that we present to them here, because its text on several occasions approaches that of the editio princeps. It will be seen that the first edition is actually based on another old version of the text which deserves our full attention. I leave the critical study of the text of our fragment to others, more qualified, and I shall restrict myself to some remarks on its external aspect. 2. The traces of his blazon in the frontispice of the ms are still recognizable. 3. Paris, Bibl. Nat. ms. lat. 1622. 4. Cf. C. Schenkl in his preface to the edition of Cl. M. Victor (C.S.E.L. XVI), p. 339, 342-345. J.H.W. Here is the description: A single leaf cut into two by a bookbinder, but fortunately in such way that the text was not damaged. These two halves were employed formerly as endpapers of a book small-in-folio in which had been gathered copies of acts concerning vicariates of the manor of Keppel. It can still be seen how the needle of the bookbinder bored the parchment, leaving a small mitre. Originally the whole seems to have been wrapped with an border of very thick parchment, like the other registers of the 16th century of this small manorial chancellery. We will return to this later. First we will discuss our fragments themselves. 5. Everything suggests that the source is a large scriptorium of a cathedral: large margins, imposing writing, higher quality of parchment (this one was very well prepared: it is almost impossible to distinguish between the flesh-side and hair-side). Cf. W. M. Lindsay, The (early) Mayence scriptorium - Paleographia Latina IV (1925), p. 15. I will restrict myself to discussing some characteristics. Form of the letters: We can see that the a is written as a double c - the uncial form9, the capital N at the beginning of words, the ligatures re10, st, and NT (once) and the archaism ec (v°, 1.1). 11 With the long i of Item (v°, 1.26), the elongated i after l in seculj (v°, 1.21) and the e shown elongated after the last r of persecutores (v°, 1.26), I think that this underlines the essentials. Abbreviation: Apart from the nomina sacra, only the abbreviation for m is used. I will cite finally some characteristics of orthography. u = b (liuacunculo, r°, 1.3). 7. One can observe the separation of the words which is very defective and in particular the bastes in the shape of bludgeons, those of h and d bent towards the left. Cf. L. W. Jones, (Script of Cologne from Hildebald to Hermann (Cambridge, Mass. i 932), pls. 32 et 38. 8. Jones, pls. 22-66.The author distinguished more than 80 copyists at that time, which he called "middle Hildebaldian" (c. 795-c. 816). 9. Jones, pls. 221, 32 (upper part). 10. Jones, pls. 221, 32 (upper part). 11. A. Chroust, Monum. Palaeogr. II, 7, 1 (= Jones, pl. 221. ), description. 12. Jones, pls. 44, 53, 57. 13. An insular characteristic. Cf. L. Traube, Vorles. u. Ahb. II (1911), p. 62. Here are the variants: in the first column is the text of the Vienna edition, in the second that of the codex of Paris, finally in the last what our fragment gives us.14 When the text of our fragment is in conformity with the edition of Mesnart, the variants are printed in italics. Since this last is our starting point, I passed over all the variants of the Agobardinus which do not have any relationship with the text of our fragment. One will find this one in the edition of Vienna (C.S.E.L. 20), p. 26, cap. 27, 1. 22 gratissimis - p. 29, cap. 30, 1. 1 contra. The value of our text can be seen even at the beginning, since it supplies a gap in the Paris ms: in the Agobardinus lines 1-10 are missing. 14. V = Ed. of Vienna A = cod. Agob. B = Ed. of 1445 Fr. = our fragment. 15. As for the second passage: a carolingian copyist not knowing ueitum would have changed it into vitium. We have seen that it is unlikely that our fragment was a leaf of Mesnart's codex: though independent of this last, its text is very close to it. However this proves the existence in the 9th century of a family of mss. of Tertullien with a text differing considerably from that of Agobardinus. It is known that five years after the edition of Mesnart, Sigmond Ghelen made a new edition of Tertullian. In his foreword the scholarly corrector of the printing works of Froben in Basle mentions "complures codices veteres e Gallicanis Germanisque bibliothecis conquisitos ". Undoubtedly, it is necessary to take care not to take literally such assertions of an editor of the 16th century, but Gelenius had the reputation of a very modest scholar and an enemy of posing and boasting.16 Certainly his very hazardous conjectures sometimes have been the subject of severe criticism, but does one have really the right to describe it as "vanus "? 16. B. Röse, Sigmund Ghelen in J. S. Ersch and J. G. Gruber, Allgem. Encyklopädie der Wissensch. u. Künste LXVI (Leipzig 1857), pp. 269-275.
tempera et inuitator ipsorum est. nostrae coenae, nostrae nuptiae nondum sunt, non possummus cura illis discumbere . . .
B: Proinde . . . ac si .. . deliuacunculo uenenatu nec tangi . . . imitator . . . nondum sum, non possum . . .
Gel. (1562)17. proinde . . . ac si . . . de liuacunculo uenenato: nec tanti . . . et invitator . . . nondum sunt. non possum . . . Fr. : proinde . . . ac si . . . deliuacunculo uenenato nec tangi . . . et inuitator . . . nondum sunt non possumus . . . It can be seen, that in this place the edition of Ghelen follows almost everywhere the redaction of our fragment. 17. I have not been able to consult the edition of 1550.
a new register of holdings, at the same time as he had other mss bound. The technique of these bindings is similar from every point of view and in all these mss. one finds endpapers which are simply the remains of old mss. of various epochs. The binder, a simple travelling craftsman or perhaps residing at Doesburg, a neighbouring small city18, seems me to have bought sometime a job lot of parchment made up of pieces from old mss. (the majority of German origin) of the 9th to the 14th century. Without any doubt our leaf comes from such a retail activity. I thus would by no means exclude that we have found here a leaf detached from one of the mss. consulted by Ghelen for his edition. If, on the contrary, the codex of our fragment was unknown to the editors of the 16th century, we have the proof here that formerly there existed several mss. of Tertullian currently unknown. 18. See above. The fragment of Doesburg was used as a chemise for the accounts of 1558-' 70 of this city. However, precisely at the same epoch the remains are to be found at Doesburg of another very old fragment of an ms. The technique of this bookbinder however, differs from that of the bookbinder of the lord of Keppel. 19. P. Lehmann, Franciscus Modius als Handschriftenforscher - Qu.u. Unters. zur lat. Philol. des M.A. III, 1 (1908), p. 99 -100. 20. Ph. Jaffé and G. Wattenbach, Eccl. metropol. Coloniensis codd. mss. (Berol. 1874), p. VIII. to consult a well-known, but extremely rare, study by A. Decker, Die Hildebold' sche Manuskriptensammlung des Kölner Domes.21 Though out of date now and superceded by the study of P.Lehmann, Erzbishof Hildebald und die Dombibliotek von Köln,22 this former provided us at the same time with a supplemented and annotated edition of a catalogue of the books of the cathedral, written into 833. This catalogue was known still in 1634 by the historian Egide Gelenius,23 who unfortunately published only one appendix containing only the list of the manuscripts on loan, followed by the names of the borrowers. In 1752, the date of the catalogue by the Jesuit Jos. Hartzheim,24 this invaluable document had disappeared. Fortunately, in his introduction, the author does not fail to inform us that he consulted letters of Hittorpius, Calenius and Pamelius, of which he quotes passages, showing that this ancient catalogue was consulted by these scholars. Decker deserved well of the history of the carolingian era by finding a very old codex of the Liber Fulgentii Ferrandi diaconi ad Reginum comitem (8th - 9th s.) which had been mislaid at the vicariate-general of the archbishop, and which contained at the same time this famous catalogue. The value of this last, which mentions no fewer than 175 mss. of which 46 still exist, cannot be over-estimated and one regrets only that Jones, while writing his monograph, did not republish this catalogue with new annotations.25 Indeed, the edition of 1895 is very rare and in the future this list will have to serve as the basis for all research on the anicent mss. of Cologne. 21. Festschrift der 43. Versamamlung deutscher Philologen u. Schulmänner . . (Bonn 1895), p. 213-251. 22. Zentralbl. f. Bibliotekswesen XXV (1908), p. 153-153. 23. One must take care not to confuse this Cologne historian with Sigmond Ghelen, the corrector of Froben. 24. Catalogus historicus criticus codd. mss. Bibl. Eccl. metrop. Coloniensis. 25. Once again this invaluable codex seems lost. Mr. B Bischoff of Munich, one of the greatest experts on German mss., had the kindness to inform me that since 1934 he has been attempting to find it, but unsuccessfully. Did Jones who discusses it too superficially, really ever see this ms with his own eyes? the library? I fear not, but it remains always possible that Sigmond Ghelen, his predecessor by about thirty years, consulted it. I thus hold that it is by no means excluded that we have found here a leaf detached from one of the mss. consulted by Ghelen to the profit of his edition. 26. Decker, nr. 98 (pp. 227 et 249). G.I. LIEFTINCK, Un fragment de De Spectaculis de Tertullien provenant d'un manuscrit du neuvieme siecle, Vigiliae Christianae 5 (1951) pp 193-203. © Brill Academic Publishers, 1951. Reproduced by permission of the publisher. All rights reserved. This translation by Roger Pearse. This page has been accessed by people since 27th October 2000.